Yesterday was the most odd day. I woke up at 7:30am when Lu did and I could barely lift my head off the pillow. Usually, I get ready with Lu when he wakes up for work, but I just couldn’t pull myself out of bed. So, I grabbed my laptop and laid in bed and posted yesterday’s recipe, and fell back asleep until about 12:30/1pm. I had no appetite, but I knew that a solid meal would help energize me, because I had a lot to accomplish. 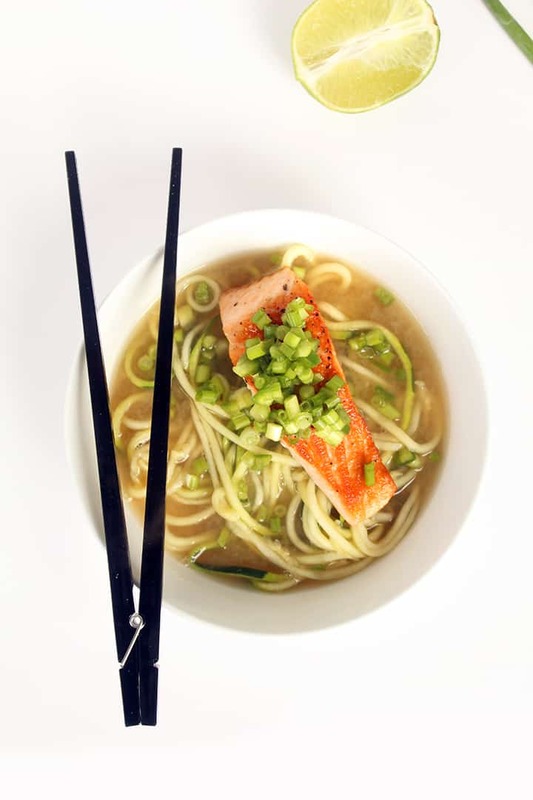 I made a bowl of zucchini noodles with a miso broth, salmon seared with ginger and a jalapeno-scallion relish. Very random, but I wanted the health benefits of ginger, salmon and vegetables. Plus, if anything, when I’m sick, I want soup. I wasn’t going to post this recipe, actually, because it was pretty simple. But delicious, of course. But then, I saw all of your Instagram comments come in, asking me if I was going to post the recipe and tagging your friends. Obviously, I had to share the recipe! 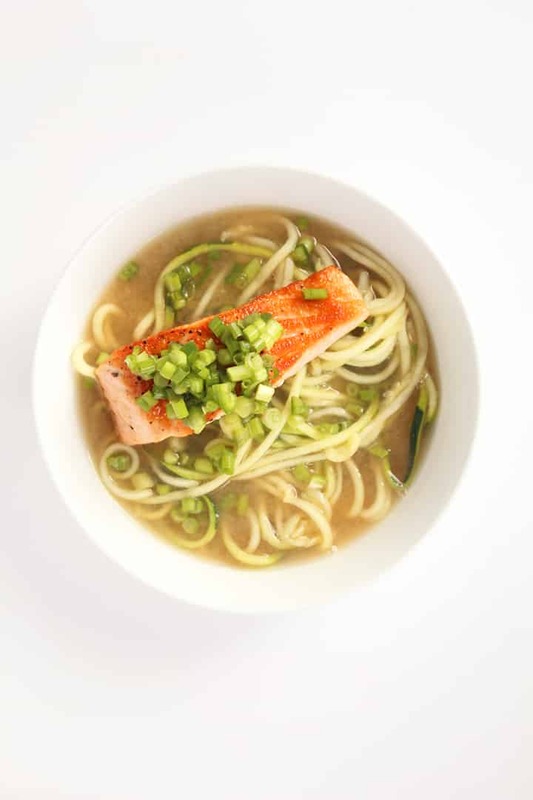 The warmth and savoriness of the miso broth infuse the zucchini noodles as they boil together. 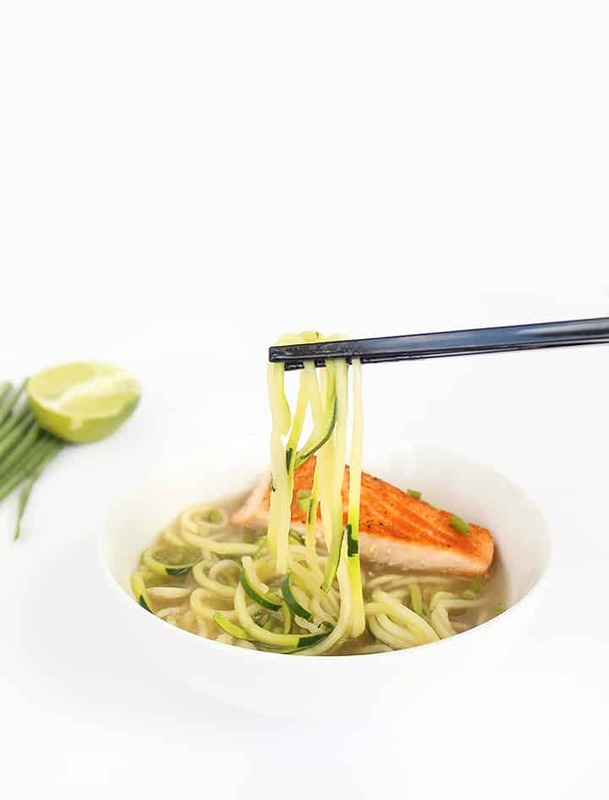 This soup alone (just noodles and broth) is a delicious base for any type of noodle soup. The salmon I seared in ginger for extra nutrients and help with my tummy ache (man, did it do the trick!) and the jalapeno-scallion relish adds a tangy, earthy taste, completing the dish. Eating well is the magical remedy for any sickness, and while I’m bummed that I’ve been feeling under the weather, I’m happy it inspired today’s recipe. What’s your favorite meal for those times when you’re feeling sick? Place the jalapeno, scallions and lime juice in a bowl and set aside in the refrigerator. Season both sides of the salmon pieces with salt and pepper. Place a large skillet over medium-high heat and add in the olive oil. Once oil heats, add in the crushed ginger, stir and add in the salmon. Cook for 3 minutes, flip over, and cook another 5 minutes or until salmon flakes easily with a fork. 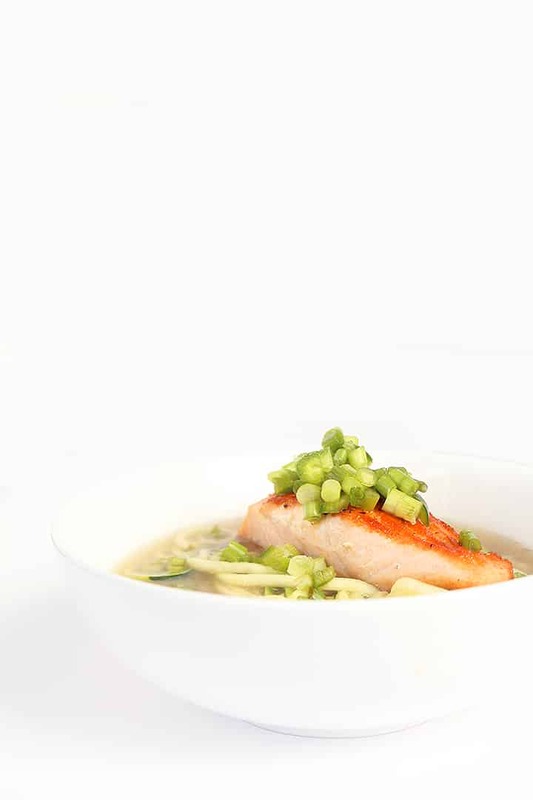 While the salmon is cooking, place a medium saucepan over high heat, add in the vegetable stock and water, and bring to a boil. Once the soup is boiling, ladle out about 1/3 cup of the soup into a bowl. In that bowl, add the miso paste and whisk until it dissolves. 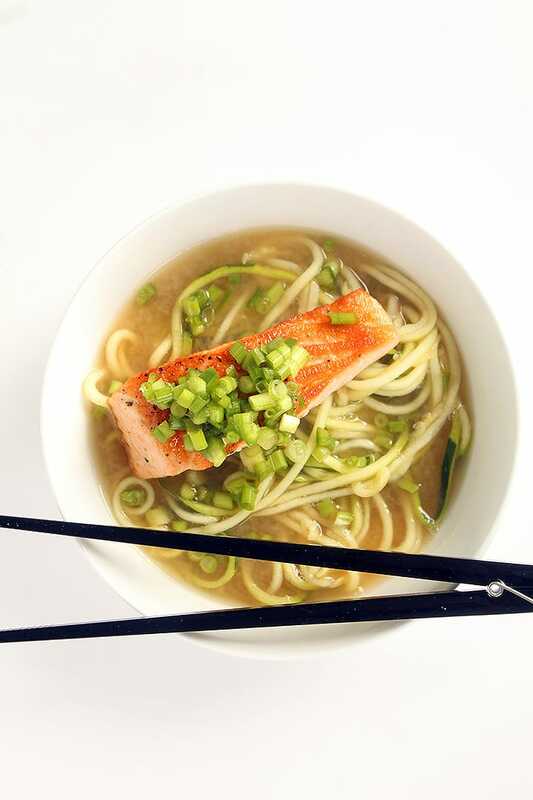 Pour this miso broth back into the saucepan and lower the heat to a high simmer. Add the soy sauce, zucchini noodles and pepper to the soup. Let cook for 2-3 minutes or until zucchini noodles soften to al dente or your preference. 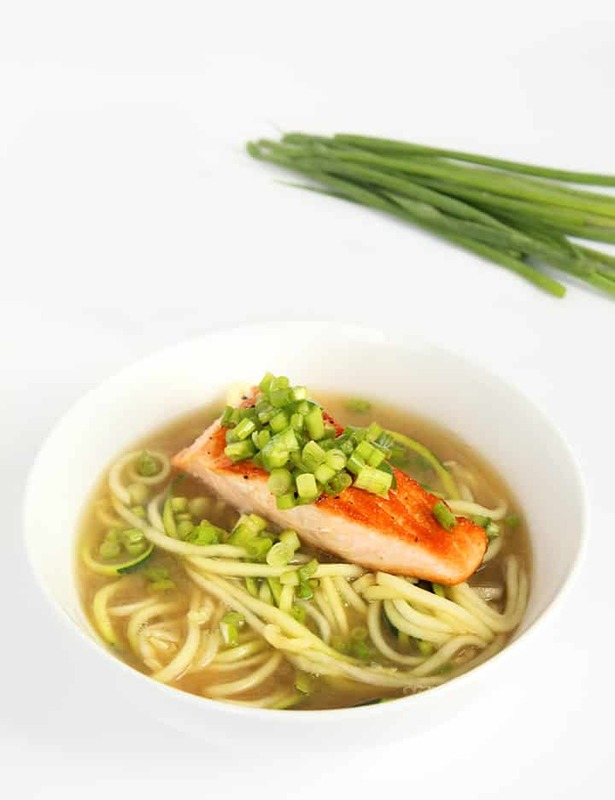 Ladle the soup into two bowls, add the seared salmon and top with jalapeno-green onion relish. OMG This looks so good! A perfect first day of autumn meal. So creative! That's it, I think I have to add a spiralizer to my wedding registry...I know I would get so much use out of it! (In fact, I should probably just buy one NOW because wedding diet, ha). Trying this tonight! Looks yummy. Can I freeze the zuchinni noodles? I want to share them with my daughter who has crohn's. There's a full post about this on my How To page! Made this tonight and it was a huge hit!! Next time I will add another zucchini or two. The relish has nice sweet acidity that cuts really nice with the broth! One of my favorites from your site! Thank you!! Thanks so much, I'm so happy you liked it! Hi Ali, I love all the flavors in this dish. Just letting you know that I featured this recipe in my round-up of 25 Deliciously Healthy Low-Carb Recipes from September 2014. Hope a lot of my readers will click over here and try the recipe! This is SO good. I made it tonight with tofu in place of the salmon (followed same cooking directions thou) and it was delicious! I saved the other half of broth and relish to make it again :) Tomorrow I'm making your biryani with tofu! This was our first attempt at spiralizing. What a great introduction. It was delicious. Left our the jalapeño and added mushrooms. This recipe is amazing. Flavor burst from the relish was super, was I surprised! The second Inspiralized recipe I tried - so excited to keep going! Filling and satisfying meal. I just got a spiral slicer for Christmas, and I made this dish last night. My husband doesn't like zucchini, so the whole time I was preparing the meal he was flipping me ish about "noodles". (He didn't have long to trash talk, the whole dish came together in the blink of an eye.) HOWEVER: once we started eating, his eyes popped open, and with his mouth full of food he poked me and made a face and sound that conveyed the sentiment that this was indeed a mighty tasty dish. All the salmon here was skin-on, however it was easy enough to peel off after searing. Since I like my salmon rare, I only cooked it for about half the time suggested. Long story short: this is going on regular meal rotation. Ali- for crushed ginger do you just put ginger through a garlic press or do you buy "crushed ginger"? Just bought a spiralizer and this was my first recipe! Turned out really well, I'm inspired now to try other ramen variations using courgette noodles!